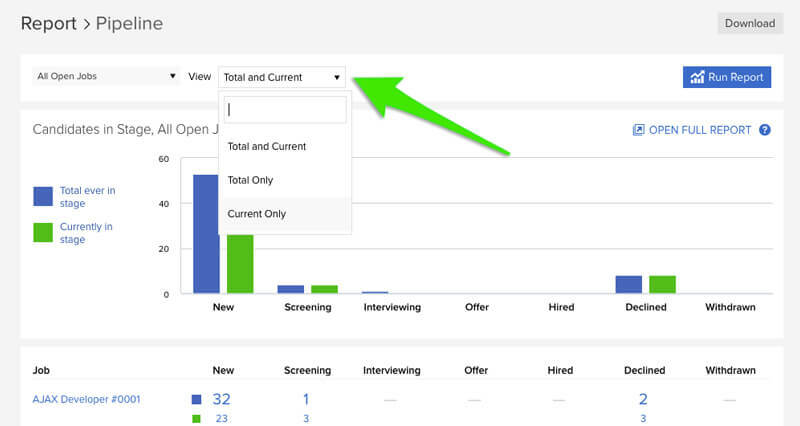 One of the most used, and most useful reports in JobScore is the Pipeline Report. This report provides the information that everyone wants about how things are going. By default the pipeline report shows a side-by-side view of how many candidates have ever been in a specific stage (total) and how many are currently in a stage (current). “Current only” and “Total only” are also reflected in the download – so if someone needs a spreadsheet of candidates by stage for your open jobs, you can build it with one click.